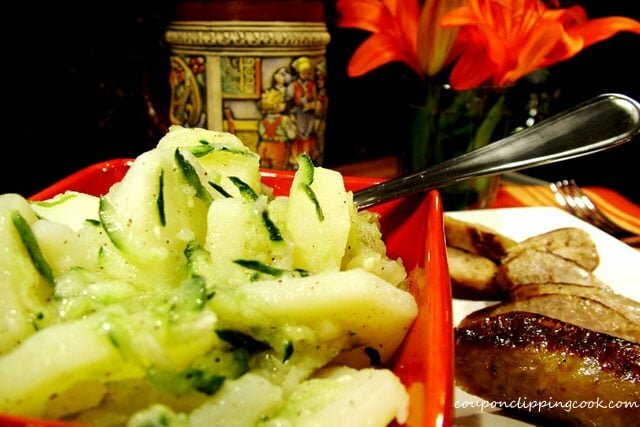 This potato salad has a great bite to it. 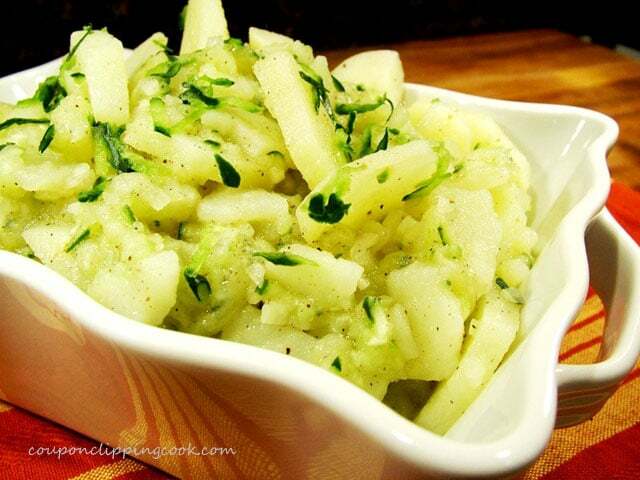 The apple cider vinegar, cucumbers and diced onions are a perfect match with the potatoes. 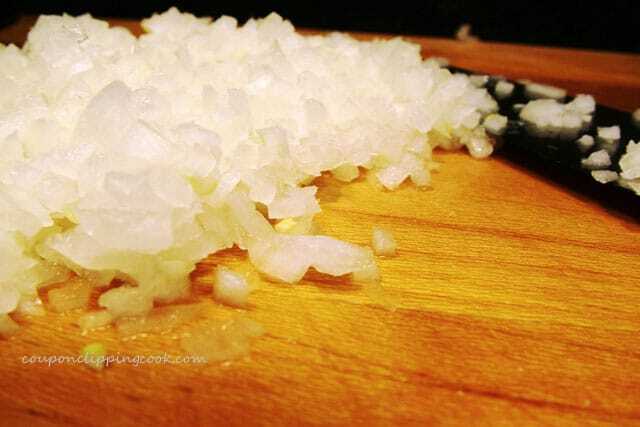 It’s the salt in this dish that really brings out the flavors. 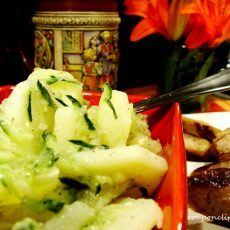 German potato salad recipes often include bacon, and as much as I love bacon I actually like that this recipe doesn’t have bacon in it because the simplicity of the ingredients really works. 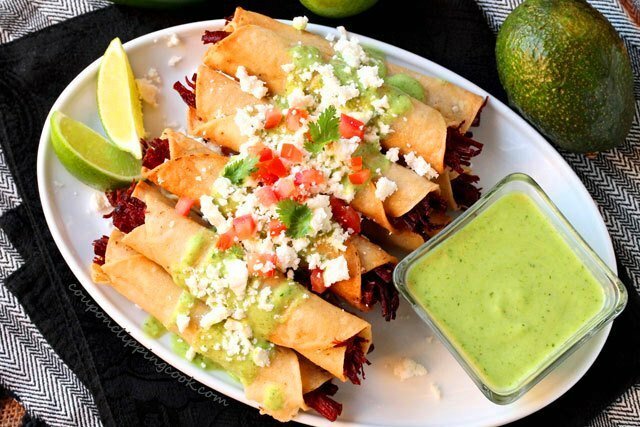 This dish is light and fresh and is a nice change from the mayonnaise based salads. The following recipe makes approximately 6 servings and actually tastes best when served at room temperature. 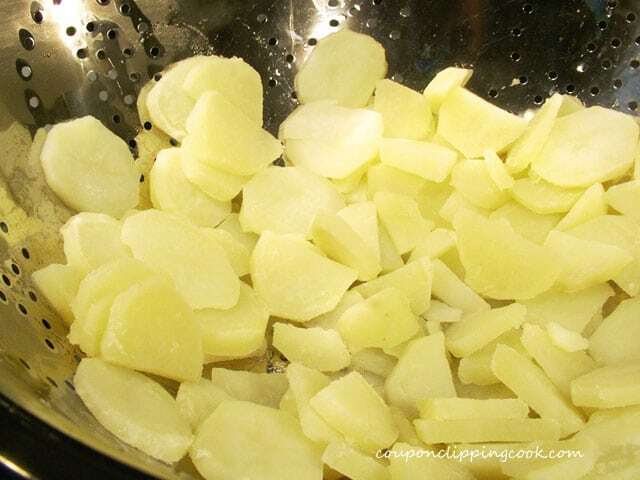 …and slice the potatoes widthwise about ¼ inch thick. 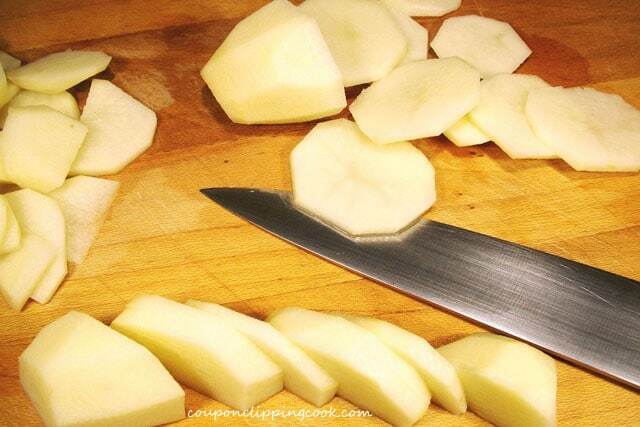 Boil the potatoes in salted water until you can slice them with a knife. Cooking time is about 6 minutes. Be careful not to cook them too long or they will be too soft. Drain the potatoes and let them cool. 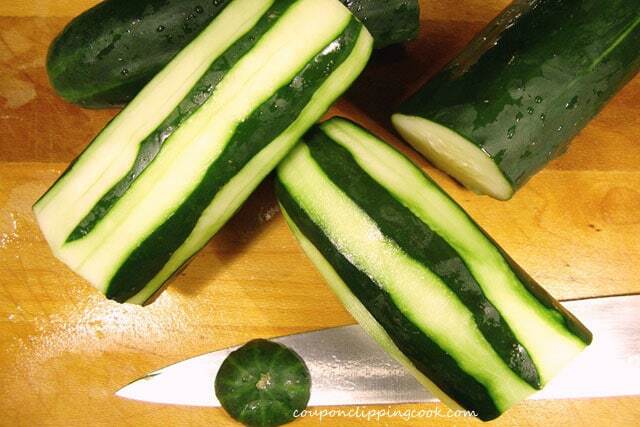 Peel the cucumbers in ¼ inch strips, staggering the peels so that there is ¼ inch peeled then ¼ inch skin showing. Save some of the skin and shred for garnish. Shred the cucumbers and put them into a medium size bowl. 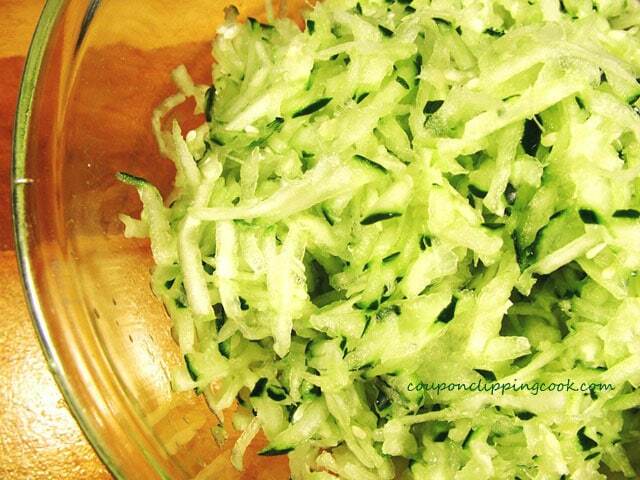 …add to the bowl with the shredded cucumber in it. Set aside. 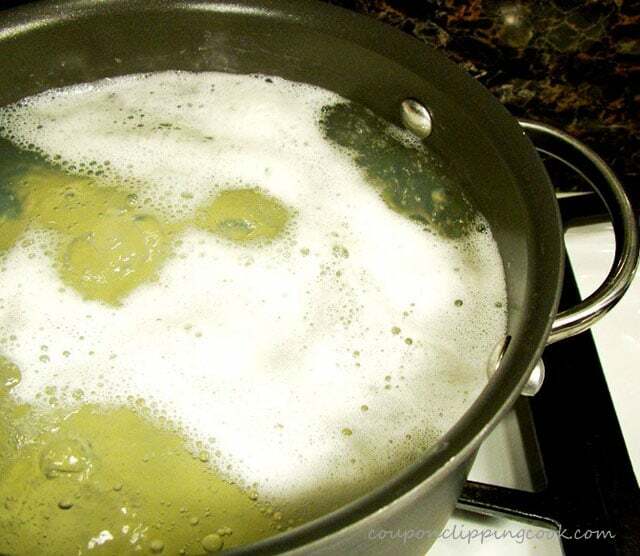 Add 5 tablespoons each of the oil and vinegar. Whisk together. Set aside. 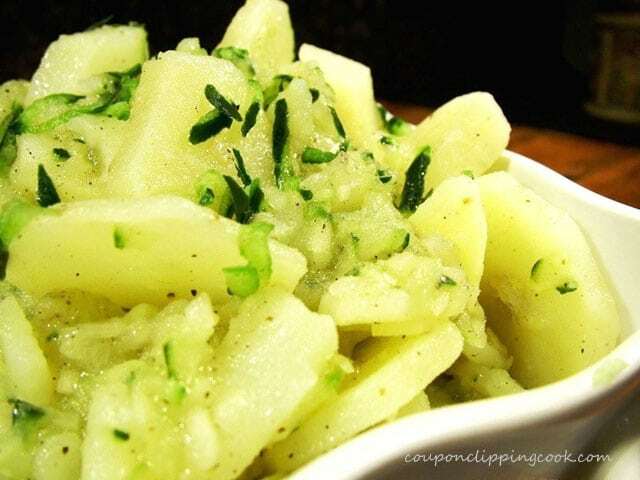 In a large bowl, add the potatoes (cooled), cucumbers and onion. 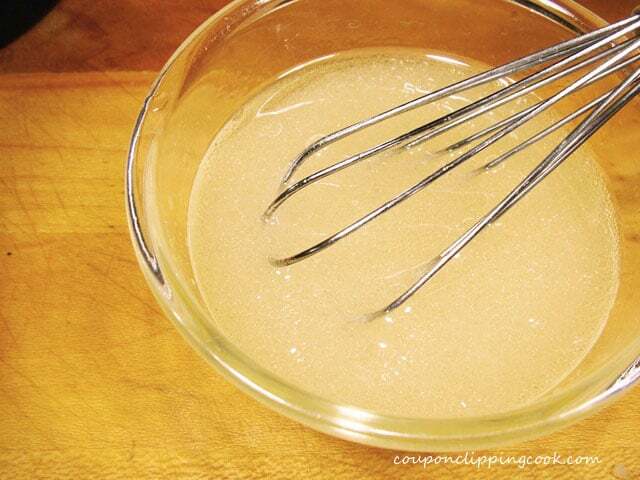 Whisk the oil and vinegar again and add to the bowl. With a soft spatula, gently mix the ingredients together. Salt and pepper to taste. The salt really makes this dish pop so as you taste-test the salad, consider using more salt if you’re not tasting a tart flavor. 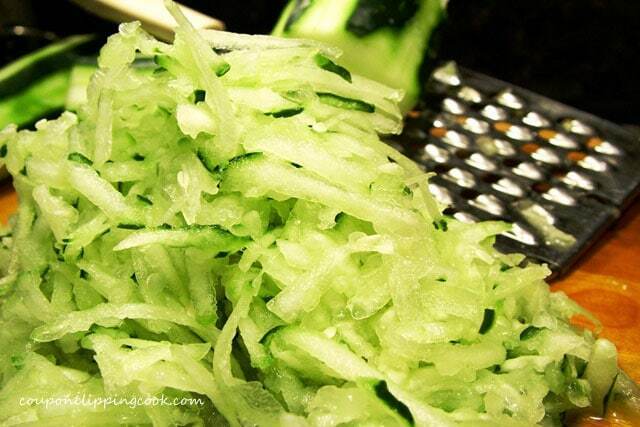 Garnish with leftover shredded cucumber skin. This tastes best when served at room temperature. Potato salad with a delicious unique tart flavor. 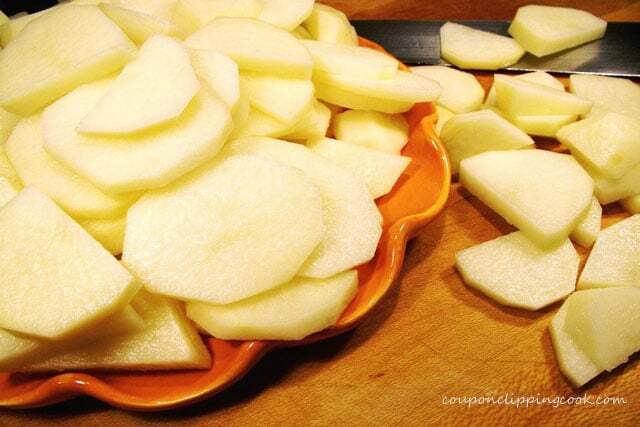 Peel the potatoes and cut them into slices that are about 1/4 of an inch thick. In a large sauce pan add water and salt. Heat the pan on medium heat and bring the water to a boil. 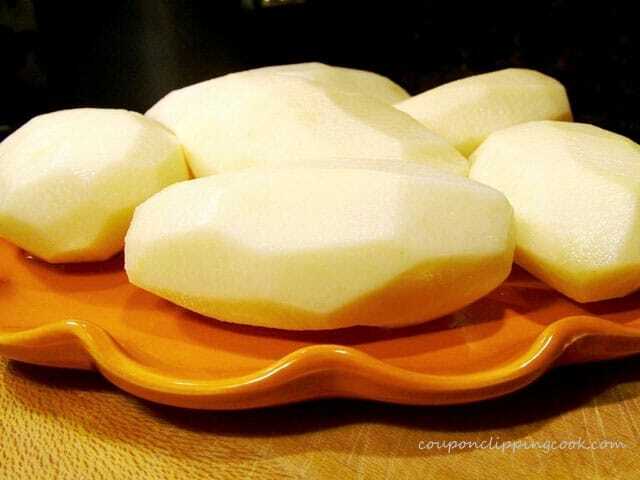 Boil the potatoes until they can be sliced with a knife (about 6 minutes). Be careful not to cook them too long or they will be too soft. For the Cucumbers - Peel the cucumbers in ¼ inch strips staggering the peels so that there is ¼ inch peeled, and then ¼ inch skin showing. Into a medium size bowl, shred the cucumbers. Save some of the skin, and shred for garnish. 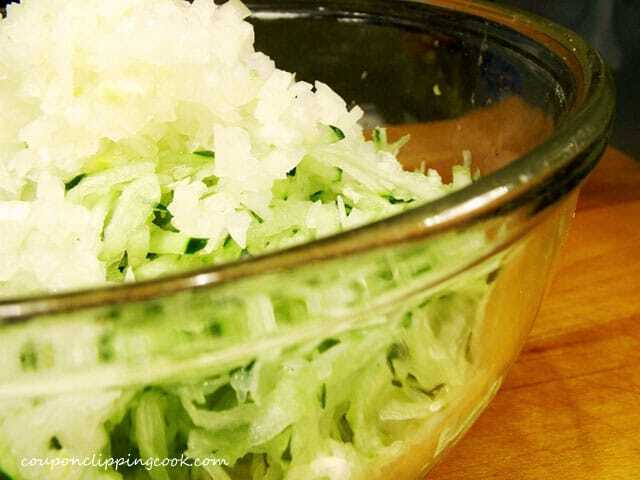 To the bowl with the cucumber, add diced onion and stir. Set aside for a moment. 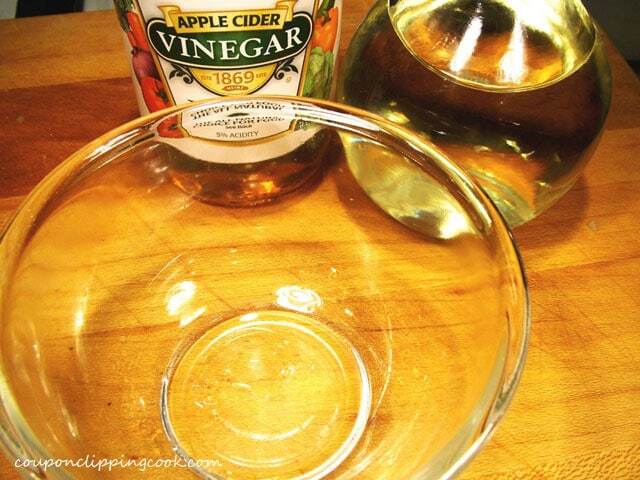 For the Dressing - In a small bowl, add the oil and vinegar. Whisk together and set aside. 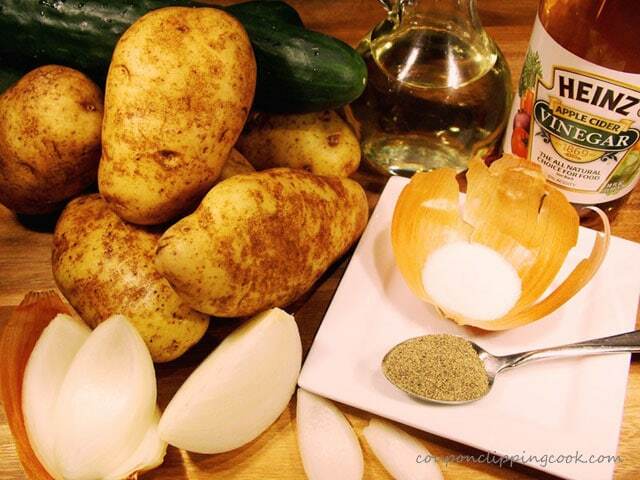 In a large bowl, add the potatoes (cooled), cucumbers and onion. Whisk the oil and vinegar again and add it to the potato mixture. Add salt and pepper. With a soft spatula, gently mix together. Do a taste test and add more salt if needed (the salt really makes this dish pop so consider using more salt if you’re not tasting a tart flavor). This is best served at room temperature. Store leftovers in the refrigerator.